Figure 1. 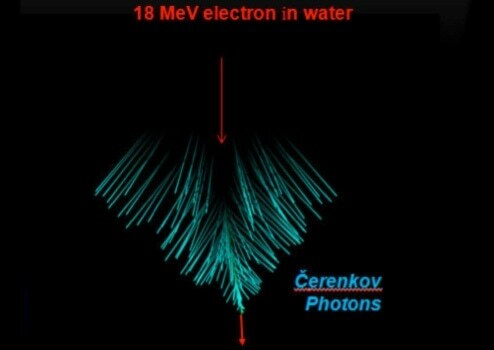 Cherenkov photons from one electron. Image courtesy of Rongxiao Zhang (Dartmouth College). Therefore, visible Cherenkov radiation is seen as a brilliant blue, because this emission is more intense at higher frequencies (i.e., shorter wavelengths).3 However it should be noted that most Cherenkov radiation is actually in the UV portion of the spectrum. Only with sufficiently accelerated charges does it even become visible. Figure 2. Results from a series of filtered scans on the wavelength of light detected from positron-emitter samples.4 The majority of the light is produced in the blue portion of the spectrum, which is expected for Cherenkov radiation, and follows an inverse relationship with the square of the wavelength. Cherenkov light extends into the green and red regions of the EM spectrum, which could increase the range of applications for in vivo imaging studies. 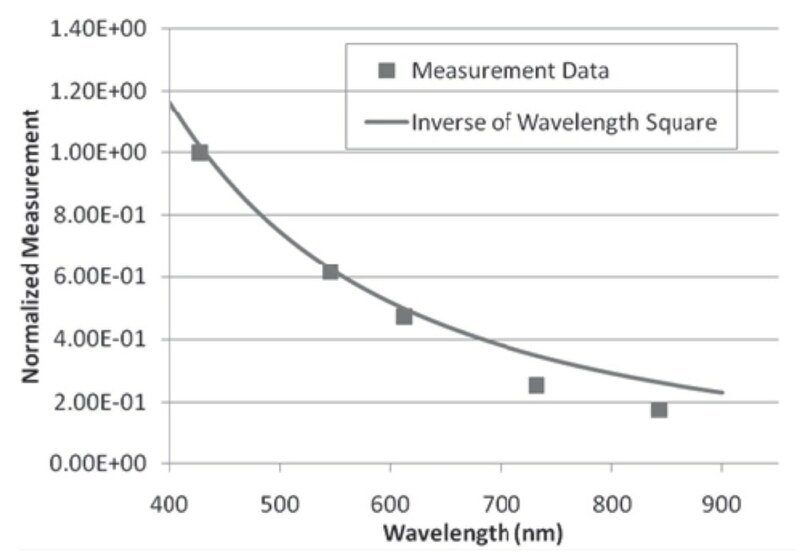 Through radiotherapy, spectral absorption features observed in the Cherenkov radiation emission spectrum can be used to quantify blood oxygen saturation (StO2) from the known absorptions of hemoglobin.2 It has also been shown that isotopic β-emitters (18F, 11C, and 13N, with energy <1 MeV)3,6,7 produce Cherenkov emission, which is frequently utilized for optical molecular imaging in small animals. 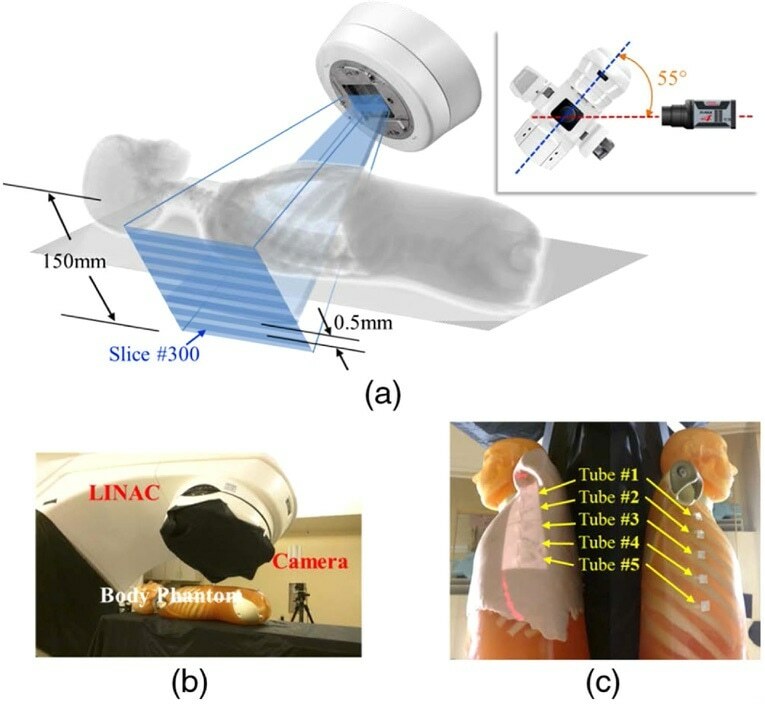 For this reason, LINAC-based optical molecular imaging is now attracting significant interest for clinical monitoring research and disease treatment, whereas isotopic β-emitters are generally used for the imaging of small animals (where far less depth is needed). Led by Dr. Brian Pogue, in 2012, a research group at Dartmouth-Hitchcock Medical Center and Dartmouth College in New Hampshire published findings from their investigation into fluorescence and absorption spectroscopy methods using pulsed LINAC-induced CES2,5 under ambient room lighting conditions. 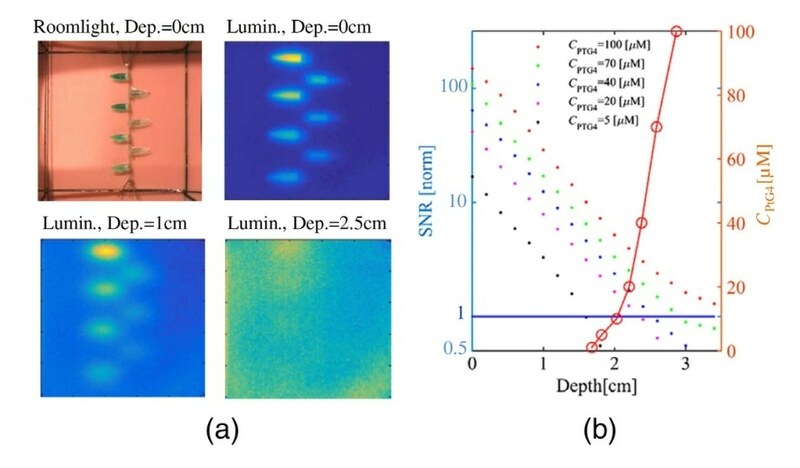 This article gives an overview of both that work as well as more recent experiments in which Cherenkov radiation was utilized by Dr. Pogue and his associates to carry out high-resolution luminescence imaging of molecular oxygen sensors located at tissue depths up to 3 cm. For the Dartmouth studies in 2012, optical spectra from a phantom were identified by employing an imaging spectrograph (a SpectraPro® 300 from Princeton Instruments) which was equipped with a 300 lines/mm grating blazed at 750 nm and connected to a front-illuminated ICCD camera (a PI-MAX®3:RB from Princeton Instruments) that was configured with a Gen II image intensifier and cooled to −25 °C. The fiber tip was positioned in the center of the radiation beam at the phantom surface for each experiment. A trigger-out voltage was obtained from the LINAC control unit and, using a BNC cable, was fed into the external trigger port of the ICCD camera. In the same way, the delay between the falling edge of the trigger signal and the rising edge of the LINAC beam on pulse was established as 5 μs. Figure 3. The geometry of the measurement system and the temporal acquisition process are shown with (A) the fast time-gated spectrometer system2 as well as (B) the timeline5 of how the linear accelerator works in pulsed mode and the way to measure decays of Cherenkov radiation emission and excited luminescence (CREL). Diagram and data courtesy of Dr. Brian Pogue (Dartmouth College). The group found that the gated signal spectrum was externally triggered by the LINAC with the ambient lights and beam on. Likewise, the ambient lights spectrum was internally triggered with gating parameters identical to that of the gated signal and the beam off. Figure 4. (a) The gated detection of Cherenkov emission with room lights on is shown with spectra acquired from a scattering phantom. The Cherenkov emission is obtained by calculating the difference between the gated signal and ambient lighting signal.5 (b) A photograph of the room with a corresponding image of Cherenkov emission from a human head phantom for radiation therapy are overlaid to illustrate the amount of ambient lighting present for all experiments.5 Data and photograph courtesy of Dr. Brian Pogue (Dartmouth College). It is worth noting that as small-animal imaging can be carried out in a dark environment (i.e., with a dark box) and utilizes isotopic β-emitters, which inherently have 2 to 3 orders of magnitude less visible light yield, a higher-sensitivity, electron-multiplying ICCD (emICCD) camera such as the Princeton Instruments PI-MAX4:512EM* can be used instead of a traditional ICCD camera. Figure 5. Measurement geometry for the body phantom is shown with (a) a schematic of the geometry, (b) a photograph of the setup, and (c) the body phantom with skin on (left) and without skin (right) with five tubes fixed onto the lateral rib area.20 Diagrams and photographs courtesy of Dr. Brian Pogue, Dartmouth College; first published in J. Biomed. Opt. 23 (3), 030504 (2018), doi: 10.1117/1. JBO.23.3.030504. The CELSI method which was used by the researchers employed sheet-shaped radiation beams from a LINAC to generate Cherenkov photons. These photons excite probe luminescence in a volume confined primarily to the irradiation sheets. For image acquisition, a Princeton Instruments PI-MAX4:1024i* gated ICCD camera plus LightField software was used (see Figure 6). An epi-illumination configuration was employed, with the LINAC gantry oriented at 145 degrees on the same side as the camera. The ICCD gate delays and widths were set in the following way: a 4.2 μs delay and 70 μs width for phosphorescence imaging; a 0.05 μs delay and 4 μs width for Cherenkov imaging; and a 1500 μs delay and 70 μs width for background imaging. Figure 6. 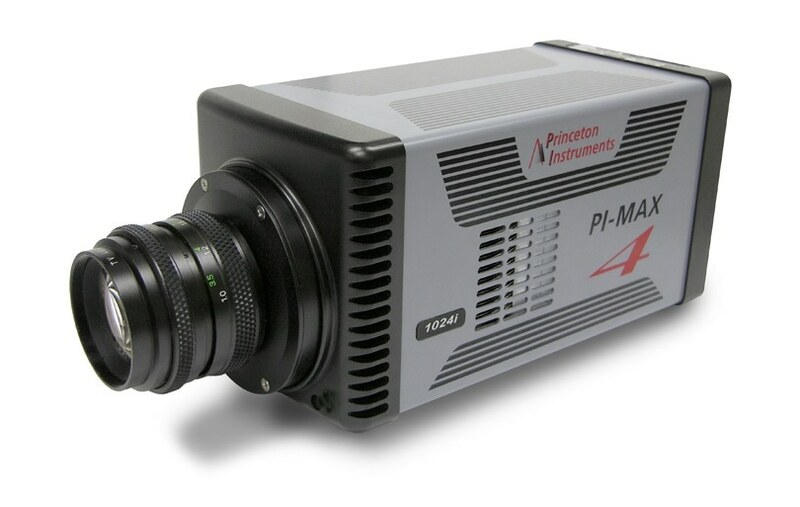 PI-MAX4:1024i-HR gated ICCD camera from Princeton Instruments. Figure 7. Image quality vs. depth for different concentrations of PtG4 (CPtG4 ) as depicted in the legend, showing (a) the room-light image and luminescence images of the phantom at three different depths in the phantom, and (b) the corresponding signal-to-noise ratio extracted from these images as a function of depth (colored dots). In the same graph, the red line shows the CPtG4 at which SNR = 1 (values on left y-axis).20 Data courtesy of Dr. Brian Pogue, Dartmouth College; first published in J. Biomed. Opt. 23 (3), 030504 (2018), doi: 10.1117/1. JBO.23.3.030504. The researchers state that, depending on tissue type, initial studies of depth sensitivity have shown CELSI would be viable for a depth of 2 to 3 cm, and that the focus of their own study was to establish the optimal positioning of the body phantom, gantry, camera, and couch in order to gain maximum sensitivity.